Matt Taylor's interest in wine was piqued during a two year stint in Europe and Africa where he learned the wonders of sherry, biodynamic farming and Burgundy. Upon returning to the United States, he worked as an assistant winemaker to Rod Bergland at Joseph Swan Vineyards. He them graduated from Fresno State and obtained a post-graduate degree in viticulture and enology. A sales job and harvest internship with the Seyesses family of Domaine Dujac led him to eventually land a job as winemaker with Araujo Estate in Napa Valley as well as harvest internships in Argentina and New Zealand. In 2011, Taylor left Araujo to start Taylor Cellars with seed money from Bart Araujo. He is devoted to organic and biodynamic farming. 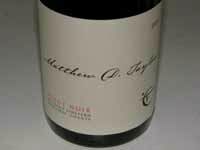 Taylor released his first eponymous wine in partnership with his older brother, Sean Taylor, from the 2006 vintage, the Matthew D. Taylor Michaud Vineyard Pinot Noir. The Pinot Noir is served at top restaurants such as the French Laundry and Cyrus. The wine is sold through a mailing list. Matthew is also the winemaker for Reuling Vineyard wines in Forestville.